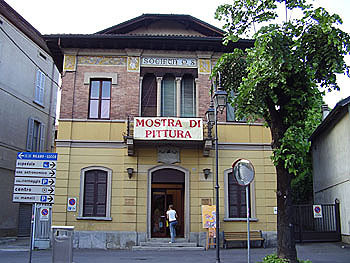 This is the Civic Centre of Merate, where the presentation of our Mission's Srimad Bhagavad Gita was about to take place. The devotees did their utmost to try to represent the Sri Chaitanya Saraswat Math in a befitting way. Considering that Merate is a very small town, the turnout was quite astounding. 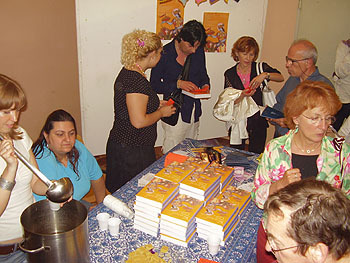 About eighty people were present, with the hall almost full. Munindra Mohan Prabhu opened the night, introducing the guests and giving an overview of how the evening would proceed. Krishna Kanta Devi Dasi, who translated the book and grew up in Merate, spoke for a while, telling her story of how she came in connection with Srila Gurudev and how it came about that she did this service. Sripad Goswami Maharaj then went on to provide some insight as to the contents of the Bhagavad Gita, and then invited those present to ask any questions, related to what he had said or otherwise. It was impressive to note the level of participation by those present, and the nature of the questions, which were very intelligent and sincere. 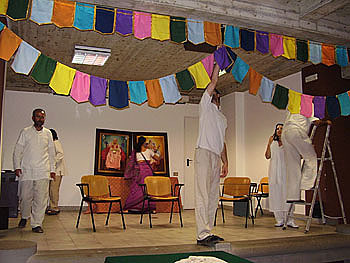 The hall was almost full, which was very encouraging for the devotees. Sripad Goswami Maharaj answered questions in English, with Krishna Kanta Didi translating into Italian, assisted by myself. 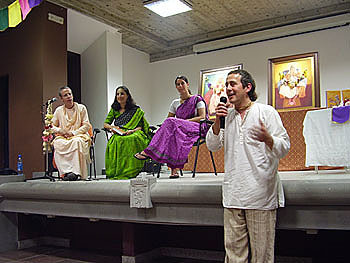 Munindra Mohan Prabhu guided the audience through the evening. 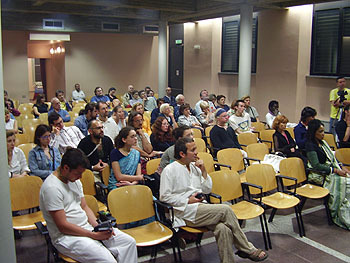 The time flew as people became engrossed in his explanations, curious to enquire after more, until Sripad Goswami Maharaj finally decided to answer a last question and invited the listeners to seek their answers and find more within the Bhagavad Gita, which was spoken by the Supreme Personality of Godhead Himself. Otherwise it seemed like the public’s thirst could not be appeased, while the devotees continued to derive pleasure in listening to the glories of Srimad Baghavad Gita, Srila Gurudev, Srila Guru Maharaj, and Sri Chaitanya Saraswat Math. Other devotees were taking care of the book stand just outside the hall, also answering questions and encouraging people to take the nectar of Srimad Bhagavad Gita and give a small donation. 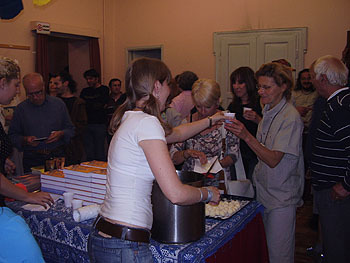 Prasadam sweets and a ginger drink were distributed to all present. 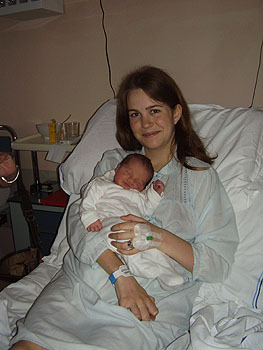 While the distribution of the Bhagavad Gita was going on, at the hospital around the corner a baby girl was born to Jahnavi Didi (right) and Advay Krishna Prabhu (above). 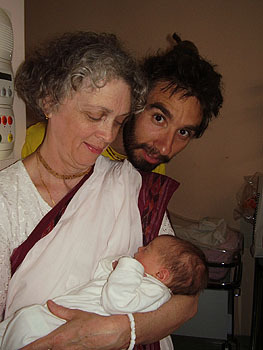 Due to this auspicous moment of her birth, the new arrival received the name Gitanjali from Sripad Goswami Maharaj.